The Dysart family managed to close down rivals which opened up until 1908, when the Earl of Dysart lost a court case against Hammertons ferry, in a case that went the whole way up to the House of Lords. Victory for the 'The Ferry to Fairyland' was commemorated in song, one of a number written about Twickenham's ferries. The rivals continued in operation until around 1970 when the old ferry, which had been sold to a private operator when the National Trust took over Ham House ceased operation, again at least in part over a long legal battle, this time over its use of the slipway. There was a long legal battle and the owners of the property at left put up the signs on their fence 'This Slipway Is Private Property'. I don't know what the outcome of the court cases was, though I think the public (and ferry) had used the slipway for many years, but of course the appropriation of the commons for private use has always been one of the basic aims of our legal system. 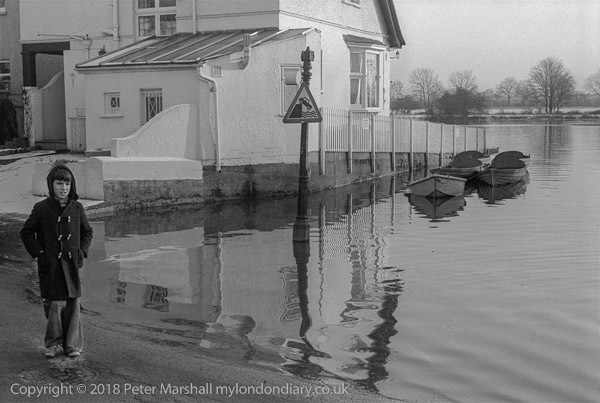 The old Twickenham ferry was the one I went across as a child to visit Ham House, rowed I am fairly sure by the man who appears in a fine photograph on the Historic England site, and it ran from this slipway close to the White Swan. Hammertons ferry, which runs from a jetty around a quarter mile downstream still operates during the summer and at winter weekends, and has an active Facebook page which includes interesting posts, pictures and videos about the river and the tides, which still trap many careless drivers parking in the area. This ferry is still a good way to visit Ham House though now a little closer to St Margarets than Twickenham station and with a few yards to walk on the opposite bank.